Hi everyone, hope you have enjoyed your weekend. 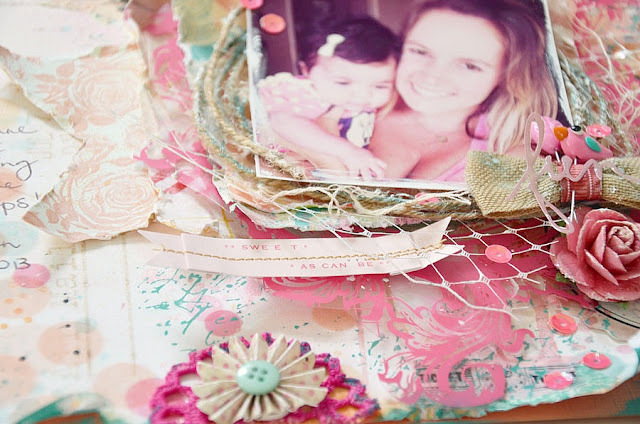 I thought I would drop by with a new Shimmerz layout I have shared on the Shimmerz blog. It's a cute instagram piccie Jod took of Sianne and I whilst I was in Perth. I couldn't help but go all girly on this one!!! Now you don't need all of the above to create something like this, some of these colours are just flicked on my page to add that little bit more colour. I just wanted to share a quick how to on the butterflies I created in the background. I apologise for the photo quality, it was a night and lighting was poor. 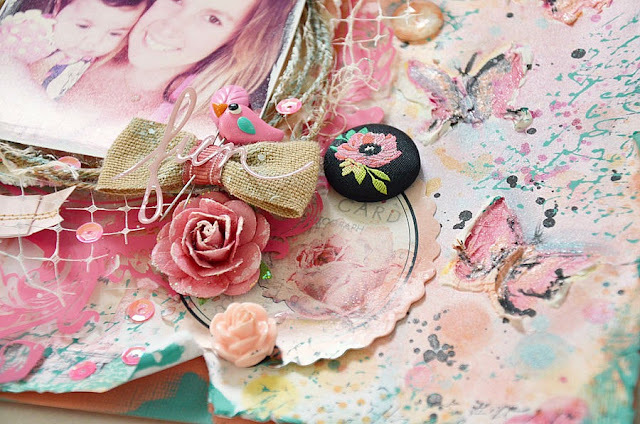 I grabbed my chipboard butterflies and placed them on my layout where I wanted them to frame my photo. I sprayed serveral bottles layering over each other. I then took all the butterflies off and put the big one back on this time holding it in place whilst I held the paper upright and let the Spritz run down the page. Using some texture paste I outlined the butterflies. 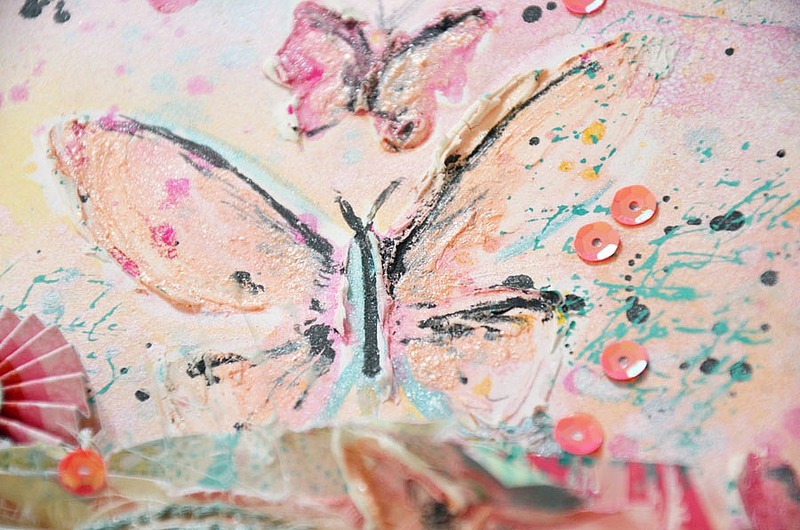 I then grabbed my Shimmerz pots and a paintbrush and coloured in the butterflies blending the colours into together. I then pulled the nozzle off the Licorice Spritz and traced the inside lines of the butterflies, also adding flicks to the page as I went. More flicks were added by taking off the lid and flicking back onto the page. I then added my photo mat for my picture. I placed another couple of butterflies around the calico to blend into the background. This is stunning! you make it look easy, but it looks so detailed to me!! Simply stunning Stacey! Love your style! Thanks for the tutorial. 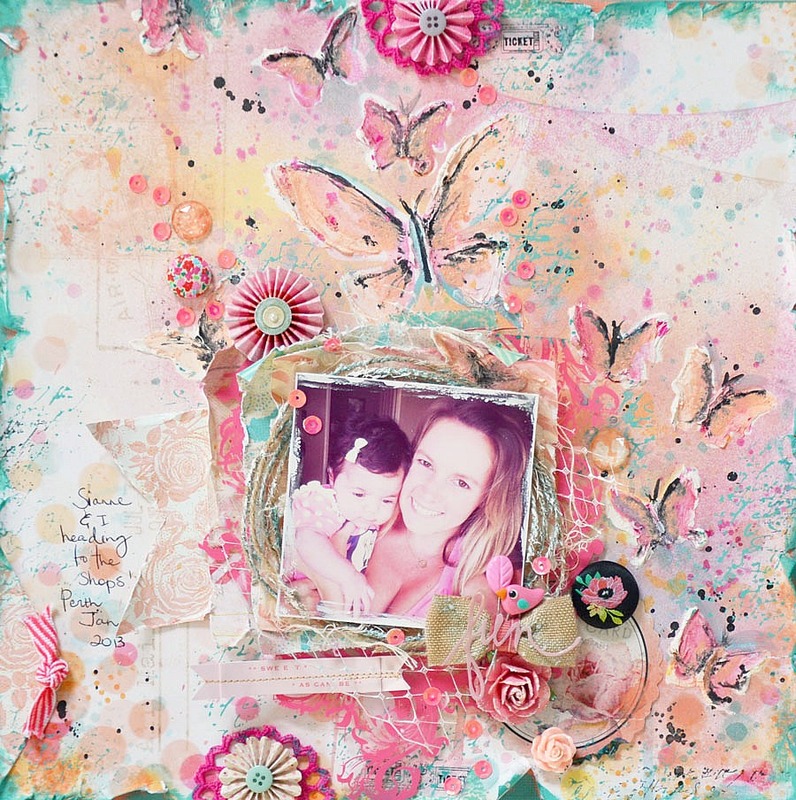 Fabulous work, Stacey!!!! LOVE LOVE LOVE it! your butterflies are so beautiful!!! Thanks for the step by step Stacey!!! it looks gorgeous!!!!!!!! !